Right near the entrance of Fukuoka, Fukuoka Airport and Hakata Station! It is an advantage that the locations of the service offices are very close to Fukuoka Airport and Hakata Station near the gateway of Fukuoka. Fukuoka Kūkō Store is only 3 minutes walk from Fukuoka Airport Terminal 2 Bldg. Hakata Eki Store is just outside of the exit of Hakata Station Chikushi-guchi. In addition to the great location, Fukuoka Kūkō Store is open until 10pm and Hakata Eki Store is open until 9pm. 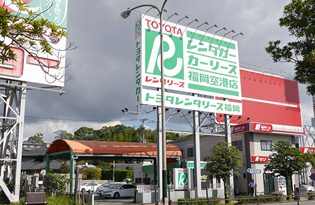 Those who want to rent a car just after arriving Fukuoka at night time might want to check TOYOTA Rentalease Fukuoka. Click Here for narrowed search for deals at TOYOTA Rent a Car and leases in Fukuoka area.